There are loads of different jobs that you cab do in this world because, as fate would have it, we all need to work for a living - except for a lucky few but we won't talk about that. There are jobs that you can do that are mainstream and there are obscure jobs that some people will be surprised even exist but for this Brinley Williams collection we will be focusing on some of the more popular and well known occupations. 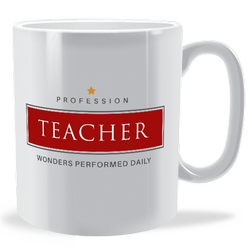 These occupational mugs make great gifts for colleagues, friends and family or even something that you can buy for yourself if your are lucky enough to be qualified to undertake any of the professions on the list. Whoever the recioient is of one of these mugs they will surely enjoy taking a break from their hard working role and having a cuppa. And there is an added bonus because not only are the designs in this collection available on either bone chgina or ceramic mugs but they are also available in 8 different colour variations. The latter fact is important if quite of few people in the same department and having the same job all decide to buy these mugs.